Clinical trials are a vital element of evidence-based healthcare. And, increasingly, trial registries are being searched as part of evidence synthesis activities. As Trip’s main role is to help users find important evidence it’s natural we wanted to include clinical trials in our search index. The fewer barriers there are to finding evidence the more likely it is to be used. So, combining clinical trials in our search index makes them easy to find and therefore more likely to be used – simple really! Trip obtains trials from the American ClinicalTrials.gov website, a site with over 190,000 clinical trials. 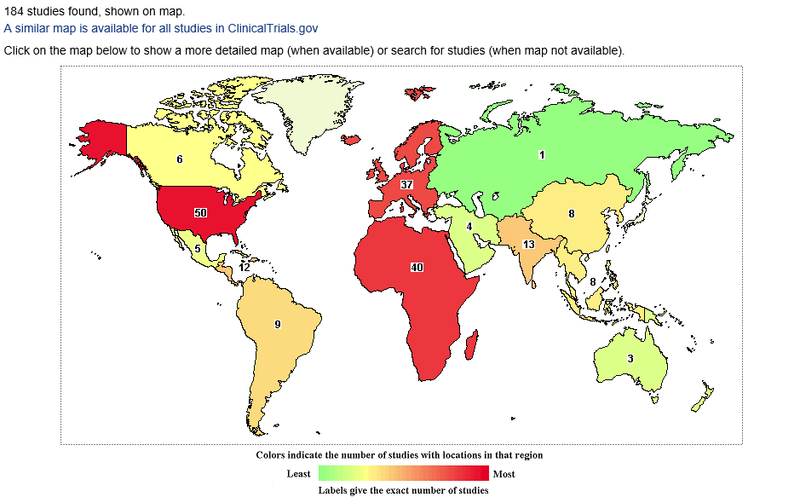 The site is a registry and results database of publicly and privately supported clinical studies of human participants conducted around the world. To be clear, it is a global database as the image below shows (for a search for measles). It really is simple. Evidence really is simple with Trip. To access this and the many other benefits of Trip Premium sign-up now via this link (NOTE: Institutional subscriptions are available). If you’re unsure or you require further details of Trip’s great power see our beautiful infographic. Who thought it’d be so complicated to secure a suitable scheme for institutions. What if they’re wrong – are there consequences? So, between them it doesn’t work! The next method I explored was by size of organisation but is that an accurate way to assess size? Some publishers use full-time equivalent staff while others use full-time equivalent users! The latter is to ensure students are counted in a universities ‘head count’ – otherwise the majority of users could be unpaying students! Each of these will be divided into 3-4 sizes e.g. very small, small, medium and large. This approach should be familiar with those involved in purchasing so hopefully it’ll be less problematic. But what I am keen to stress is, if in doubt, get in touch and discuss AND negotiate..! Improved export meta-data. Currently we only include basic data such as title, publication and year. We’re now planning to extend that to include authors, volume, issue, page numbers and abstract. OpenAthens. We’re still exploring this but it looks like it’s a route that we need to go down. The only hesitation is the cost! Institutional pricing. Even though we planned it and spoke to a number of people I think the way we’ve packaged institutional subscriptions is overly complex and off-putting. So, we’re working hard to simplify this and we aim to roll out a new approach in the very near future. People have not been openly hostile about us moving to the new business model, I was expecting some abuse. I got some mild complaints from Twitter – but if that’s the worst of it. People seem happy to pay and we have a number of paying customers. Before we went live I was trying to think what might be good, bad and terrible and couldn’t actually come up with anything sensible. However, the response so far has been encouraging. But, I do need to stop checking the payments system every hour. Institutional interest has exceeded expectations and it’s been really interesting dealing with many of the queries. Internet Explorer (version 8) is not liked by Stripe, our payment system. The system to reset passwords was a bit naughty and refused to send out links to reset the passwords. Fortunately, that is now fixed! I’m beginning to better understand some of the background functionality that I’d been not really thinking about. I really need to think about VAT when setting up a payments system. I think the biggest realisation is that, to make this model work, will require significant hard work on my part! Anyone out there with (a) good sales skills (b) spare time (c) will to work on payments by results?? The new version of the Trip Database is live and to help celebrate we’ve produced a beautiful infographic. While to many the new site will not look massively different there have been some huge changes. Perhaps the biggest has been the adoption of the Freemium business model. What was previously freely available at Trip remains, largely, free but for those who want an enhanced service there is a Premium (paid for) service. We have adopted this model based on the absolute need for financial security. So, what do those purchasing the Premium model get? Approximately an extra 100,000 systematic reviews (including systematic review type content such as HTAs), more than double available via the free Trip. Another new feature is moving to a more secure site with a new password system (this is for both free and premium users). This will require users to renew their login/password details but it’s a one-off – so hopefully not too traumatic. Finally, and mentioned above, is the new Trip Evidence Service. Run by experienced and skilled information experts the Trip Evidence Service can provide various services: formal literature searches, horizon scanning and evidence reviews. Given the varied staff skills the service can also offer bespoke information services. We’ve moved in to the final stages of testing for the new site. If you’ve not seen it already, we posted a ‘taster’ around ten days ago. Assuming the testing goes well, we aim to go live over the weekend of the 16/17th May. As well as the upgrades we’re moving to a new and more secure site. The only thing you’ll notice is the need to change your login and password. This is a necessary ‘discomfort’ as the old system was very old and not particularly secure, so there was a pressing need to upgrade! This is a really important milestone for Trip. Assuming it goes well and a reasonable number of users (and organisations) sign-up to we will be financially stable – the first time in years. It should give us a solid foundation to base on next tranche of improvements – based on the work highlighted in this blog post.